A short history of the riots against new education laws that turned into a mass collective rejection of apartheid South Africa by thousands of working class black youths. The Soweto riots of 1976 were the most brutal and violent riots that had taken place against the South African apartheid administration. It was also amazing in how far and how fast it spread. Its significance would go beyond the violence on the streets. The police actions during the riots would be part of what instigated a world-wide boycott of South African produce and signalled the increased militancy of the black population of South Africa. During a reorganisation of the Bantu Education Department of the government, the South African apartheid government decided to start enforcing a long-forgotten law requiring that secondary education be conducted only in Afrikaans, rather than in English or any of the native African languages. This was bitterly resented by both teachers and students. Many teachers themselves did not speak Afrikaans (an extremely difficult language to learn) and so could not teach the students. The students resented being forced to learn the language of their oppressors and saw it as a direct attempt to cut them off from their original culture. By 1976, several teachers were ignoring the directive and were fired, prompting staff resignations. Tensions grew. Students refused to write papers in Afrikaans and were expelled. The students of one school after another went on strike. The government response was to simply shut the down schools and expel the striking students. "They opened fire. They didn’t give any warning. They simply opened fire...And small children, small defenseless children, dropped down like swatted flies. This is murder, cold-blooded murder". The most famous example of this being 13-year-old Hector Petersen, who was shot dead by police during the riots. However, the students fought hard with anything that came to hand. Sticks, rocks, bricks, even schoolbags were used to attack the police. Heavily outnumbered and unable to protect themselves from the increasing ferocity of the attacks, the police fled to regroup. With the escape of the police, the enraged students began destroying government property. During the fighting, the students also set up a series of barricades to make sure that once the police were kicked out, they stayed out. The riots began to spread all over the South African townships (squatted villages, often just outside main industrial areas, lived in by black workers) as years of built up anger and bitterness at the brutal apartheid government exploded. Realising the scale that these riots were happening on, the government reacted in the way any government would: with the full use of organised violence. After days of not being able to enter them, anti-riot units along with armed vehicles and personnel were sent to Soweto and other townships. Government officials restricted the activities of different black and anti-apartheid groups. Meetings were stopped and activists were harassed. For instance, the radical black consciousness activist Steve Biko was ‘banned’ meaning he was stopped from making speeches in public and was not allowed to be quoted in print. In the end, due no doubt largely to his disregard for this law, he was killed by the police in a brutal beating. But regardless of their actions, the government could not stop additional protests. They had lit a fire in the South African youth that could not be put out. The conflict about language had led to many students getting kicked out of school (or not having a school to go to). With no school to go to, over a quarter of a million children had a great deal of time on their hands leading to trouble in the streets daily. After Soweto, an uprising or march would take place almost every day, often completely spontaneously. 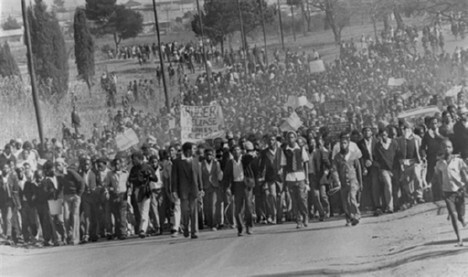 Young blacks expressed their anger at apartheid by marching, rioting and setting fire to government property. Over 360 blacks were killed in the Soweto riots of 1976. The South African government basically declared war on black school children. The government used their full physical force against the students but they did not let up. They carried on fighting and eventually the South African apartheid regime fell. There is only so much that a people are willing to take and in 1976, the black youth of South Africa told the government exactly when they had crossed that line. The Soweto riots signalled the beginning of the end for the racist, colonial state of South Africa.